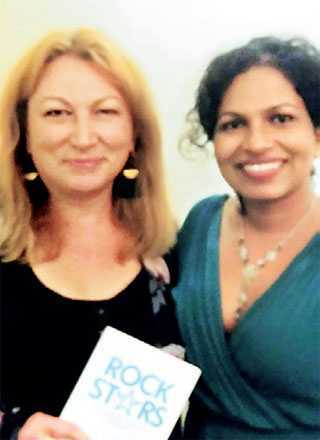 The book ‘RockStars – Growing Stellar Performers in the Organisation’ by Rozaine Cooray and Dr. Pujitha Silva was launched in Australia on 14 March, at The Grand Richmond, Melbourne, Victoria. The event was sponsored by Deakin University which is rated as one of the top 1% of universities globally, by the Academic Ranking of Word Universities 2018. Also, Deakin ranks 31 in the QS ranking of the World’s Top Universities Under 50 Years. Deakin recognised the innovative practices, research and methodologies tried and tested by Rozaine Cooray as an alumnus of Deakin University (BSc. Applied Science – Psychology) (2004), which is what led to their sponsorship of the book launch. Deakin University School of Psychology Deputy Head and Director of Internationalisation Associate Professor Linda Byrne mentioned at the launch, the value to collaborative research and publications in a cross-cultural context. Amongst persons present were notable industry heads and Sri Lankan academics and active alumni representative of various faculties and organisations. ‘RockStars – Growing Stellar Performers in the Organisation’ presents the ‘P3 GROWTHS Model’, a leadership coaching model that was authored by Dr. Pujitha Silva. The model provides a framework for an individual’s growth journey, encapsulates growing as an individual personally (I), interpersonally (YOU), and as part of a wider community (WE). The model emphasises the value of character in leadership and growth. These messages are captured in RockStars through the narrative of two men and their mentoring journey towards personal growth, meaning and purpose. Using the human body as a leadership model, each step of the nine-step model is explained through an organ of the human body. The book is written in a way that this narrative is intertwined around the description of the P3 GROWTHS Model, and takes the reader through a captivating reflection of growth in a modern context.The P3 GROWTHS Model has been the basis of a number of initiatives which were spearheaded by the two authors, in organisational, educational, and community settings. It has formed the basis for numerous leadership coaching programs delivered to managers and leaders in the organisations in Sri Lanka, the UK and Australia. It has also been used in skill and capacity development of employees at different levels of the organisation. The model has also provided a foundation for a number of community development initiatives, including the development of youth and undergraduates and structured mentoring programs for post O/L and A/L students. ‘RockStars’ is available for purchase in leading bookshops in Sri Lanka, and can be purchased internationally in print and e-format via Amazon. For more information on RockStars and its related products, visit www.therockstarcoaches.com.